My initial response to the outcome of the election was visceral. Fixing my eyes on the heavens, tears pouring down my cheeks, I searched for answers in the night sky. I did a lot of praying for this election. Issues that should abhor any God-fearing human didn’t seem to sway, move or even nudge the opponents. I had some real frustration and anger to deal with. A renewed trust in God was required and a strengthening of my own resolve to remain steadfast. 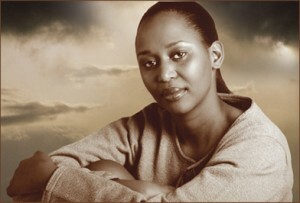 Recently, our parish had the great pleasure of hosting Immaculee Ilibagiza, the Rwanda genocide survivor. I knew a little of her story and reached out encouraging others to attend. Many came and listened, some had more pressing matters, and still others chose lesser things that got in the way of their attendance. When will we stop grasping at rhinestones while the diamonds lie unnoticed? I listened intently as she shared the story that brought this otherwise normal, non-distinct student into the world’s spotlight. Her narrative was gripping. The audience was enraptured by her account and drawn into the gradual transformation she personally underwent throughout her ordeal. She and the other women subsisted in a small bathroom, moment by moment, for ninety-one days as the genocide raged just outside the window. They were in fear of being discovered repeatedly. Immaculee’s days in that tiny space consisted of praying the rosary twenty seven times a day, as well as repeating the Chaplet of Divine Mercy many times. She shared with us that early on when she would say the Our Father she would not speak the words, “As we forgive others.” Instead she would omit these lines as if they were not part of the prayer. She wondered how anyone could forgive these people who were slaughtering her family, friends, and nation. Eventually she obtained a Bible from the man in whose home they were hidden. One day she came upon the passage on the Our Father, and realized for the first time that it was a prayer that Jesus Himself had taught His apostles. She acknowledged that she had no right to change God’s words, but then again, how could she forgive these people? In time through her daily reading, she came across the crucifixion account and found the words that Christ Himself, naked and nailed to a cross uttered; “Father forgive them for they know not what they do.” That was a defining moment for her. “They know not what they do.” Through God’s grace, these words began to find a place deep in her heart and an understanding that these people could not really know what it is that they were doing either. That became her prayer and the very mantra that allowed her to finally, and completely forgive her countrymen. When she emerged ninety-one days later, she was a scant sixty-five pounds. Yet the transformation that took place in her heart and mind was nothing less than miraculous. She spoke of her subsequent visit to the prison which was the real test of her conviction to forgive. The jailer would beat everyday those men who carried out the genocide, as he too had lost his family and friends. When Immaculee came to see the man who had killed her own family, the jailer encouraged her to take her vengeance and hatred out on him. Instead when she saw this man who was only a fraction of the man she once knew, filthy, defeated, broken and despised, it was only pity and forgiveness for him that she felt. When she stated so out loud, the jailer was angry and confused. Years later she found out that it was that very moment that transformed his own life, he had been stuck in the vicious cycle of hate and violence toward those men. Each day he would mercilessly beat them, go home and do it again the next day and nothing would change in his heart. The pain and hurt never receded. Through her decision to forgive, she was free to move forward and not remain trapped in the past hatred and pain. He too finally forgave and found a new life and family. Hatred and a lack of forgiveness only hurts and enslaves us. For me this was a very vivid and important lesson, one that I knew well, but needed to apply to my current situation. We are all sinners. We make bad choices, mistakes, and poor judgments that ultimately affect us ALL. None of us fully understands the ramifications of our actions, and the damage that we can do. When my prayer turned from anger at the choices others made, to forgiveness, a pretty amazing thing happened; I began to heal and to find an inner calm. God knows the human heart better than anyone. He knows what He is about, and what must transpire to soften hearts and minds. God can take the most unspeakable situations and use them to teach us lessons that have the power to change the directions our souls ultimately will take for eternity.